Today is part one of retold epics. We will hear more, soon, from Karyn, and it absolutely will be epic. Today is my day to talk about lovely knights and raging ladies, about feats of strength, about reclaiming honor. There is a lot that I loved about this retelling. A lot! And I don’t think it’s all/entirely because I have a super nerdy, entirely genuine love for King Arthur and his wackily, entertainingly, accidentally dysfunctional court. (That is probably some of it, though.) You may have to talk me down in the comments; this is the first write up of the year giving me even a hint of wobbly, giddy, contender-type feelings. One of my favorite books last year was Candace Fleming’s The Family Romanov: Murder, Rebellion, and the Fall of Imperial Russia. Despite having a ton of critical praise for its tight, thrilling narrative and thoughtful approach to complex history, it didn’t manage to snag a Printz (although it did win lots of other great awards). Symphony for the City of the Dead is, in many ways, a wonderful sequel to Fleming’s book. M.T. Anderson begins Symphony with Dmitri Shostakovich’s childhood, just before the end of the Romanov reign and the rise of Lenin. 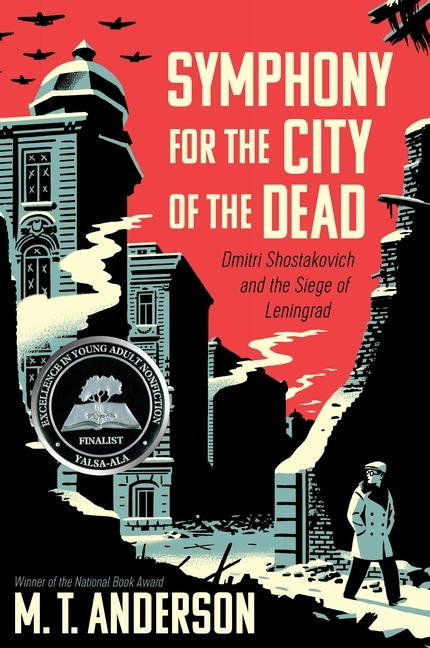 For the first half of the book he alternates between chronicles of Shostakovich’s life and the political and social upheaval in Russia beginning with the Bolsheviks and the revolution straight into World War II. The siege of Leningrad and the composition of Shostakovich’s Symphony No. 7 are the main focus of the rest of the book. Anderson—a two-time Printz honoree—does very good work here but a few things in Symphony may keep the author from earning his third Printz.